Whether you’re working on a stand-alone Avid Media Composer editing system, or serving as a team member in a collaborative editorial workgroup, there are times when you need to have media files transcoded quickly. In fact, today’s challenging editing projects often require editors to ingest and transcode media and metadata from a wide array of incoming video feeds, assets and files. This media can include: camera-based files (such as 4K and HD/SD-SDI video), compressed files like H.264, MXF, HEVC and QuickTime, live HD-SDI baseband inputs, Pro HD formats like XDCAM, AVC Intra or P2, codecs and archival tape formats. When the need for transcoding arises, this capability needs to seamlessly interface with the Media Central environment, including your Media Composer, Interplay asset management and Avid ISIS storage system. To handle tasks like checking in media assets and metadata into Interplay, this requires secure, direct communications, based on Avid SDKs, linking the transcoding process with Avid systems, such as Interplay and ISIS, through web services. And the transcoding needs to be fast, automate mundane tasks, and support a wide array of new and established video formats, among other I/O needs. 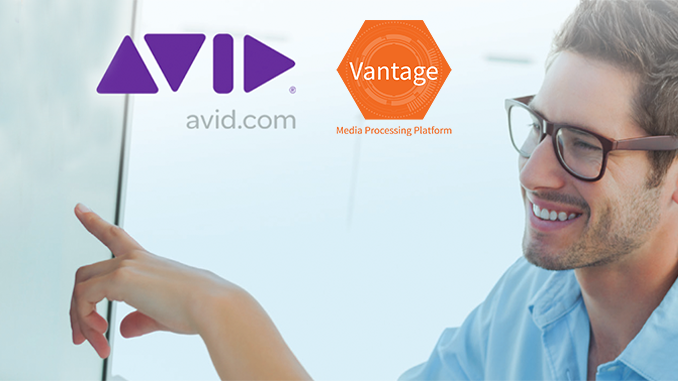 As an Avid Connect Partner Solution, Telestream’s Vantage media processing platform supports the digital media creation experience by seamlessly interfacing with Avid workflows to solve complex transcoding scenarios. It supports transcoding on the fly for popular Avid Media Suite systems, such as stand-alone Media Composers and NewsCutters, as well as Avid ISIS-based workgroups and cloud-based editing. It allows users to directly submit a timeline from Media Composer, including data tracks, through Avid’s new Simple AAF export options. It automates single- or multi-resolution transcoding for high-res and proxy files simultaneously while preserving metadata. And video, audio and metadata are transcoded, directly from existing Avid workflows, at faster than real-time speeds. Serving as an I/O bridge to Avid Everywhere, Vantage automatically handles media throughout the workflow from content creation through distribution. And it processes Media Composer timeline sequences to reformat media for multi-screen delivery for more efficient monetization. This transcoding solution integrates with the Avid MediaCentral platform in a way that can be customized to the needs of any media organization. And because it’s scalable and upgradable, it can flexibly adapt to changes in the workflow. 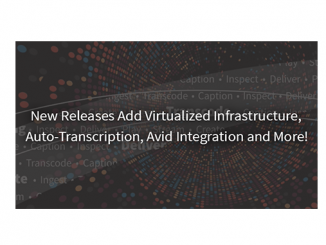 By activating Vantage’s Advanced Avid Connect options, the transcoding system interfaces with your Avid workflow, including InterPlay and ISIS, while enabling you to easily exchange content with third-party sources. If you need to ingest live or tape-based SDI baseband video, you’ll also need to have a Telestream Pipeline system as part of your workflow. Next, Vantage’s Workflow Designer helps build decision-based workflows that enable you to convert, move and store inbound and outbound media any way your editing workflow requires. Once this is done, the transcoding will happen as an integrated, transparent background process within MediaCentral. In other words, when you move your media to be transcoded into the designated watch folder, vital tasks—like media ingest, merging caption files, extracting metadata from XML and storing media and metadata on ISIS—will execute accurately and automatically. Whenever mundane, manual tasks are automated, people are free to be more productive and creative, mistakes are eliminated, and significant production time and money are saved. Learn more by visiting Telestream’s website, emailing us at info@telestream.net or phone 1-530-470-1300. 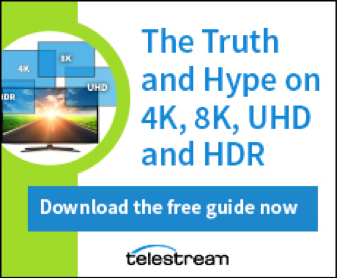 Or, for more information about 4K, 8K, HDR and UHD, download our guide here. Wirecast Gear Wins Best of Show Award!